No Bake Chocolate Mint Oreo Pie is made with an easy Oreo cookie crust filled with a creamy cheesecake filling. Takes just 10 minutes of prep and perfect for Pi Day and St. Patrick’s Day! 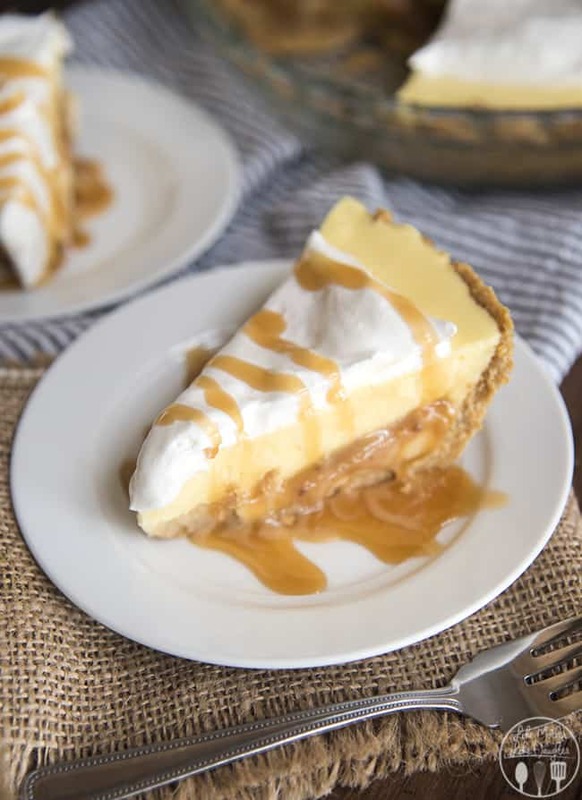 It’s National Pi (e) Day (3.14) today and I’ve teamed up with some blogger friends to celebrate this food holiday by sharing some pie recipes. Don’t forget to scroll to the bottom to check them all out! Pie just happens to be one of my husband’s favorite desserts and I made this No Bake Chocolate Mint Oreo Pie back in December when we were visiting some friends over the Christmas holidays. It’s an easy dessert that comes together with just 10 minutes of prep time. The hardest part is probably waiting for the pie to set up in the freezer or fridge. It’s made with a completely no bake crust using crushed up Oreos and some melted butter pressed into a pie pan. 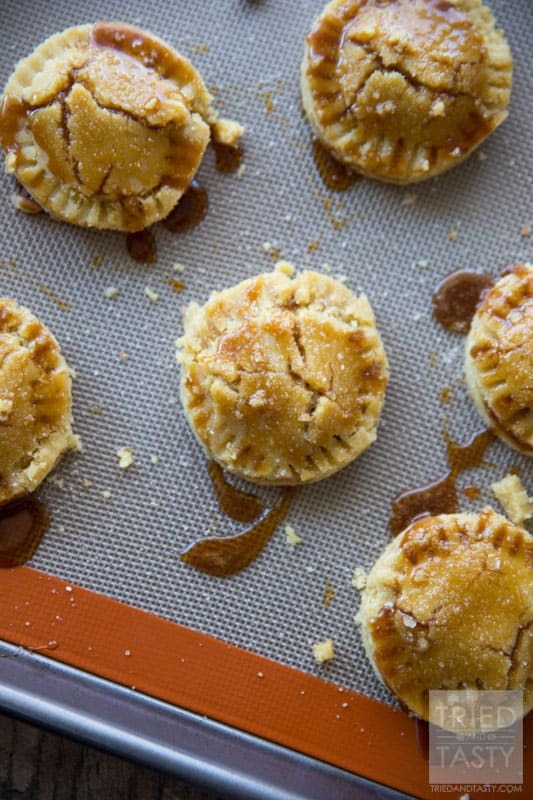 For an even easier option, you can totally use a ready-made pie crust if you’d like. The filling is a simple 7-ingredient combination of: cream cheese, whipped cream, powdered sugar, peppermint extract, chopped chocolate and optional food coloring for a festive touch. It’s topped off with a few swirls of whipped cream and whole Oreo cookies just for good measure. 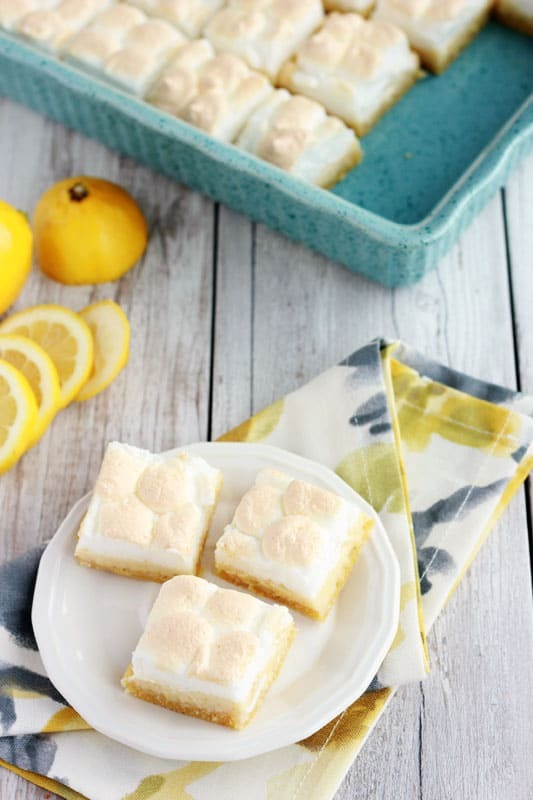 It makes one decadent, cool, creamy and deliciously refreshing dessert. This pie is perfect for any chocolate and mint fan and makes an easy fuss-free dessert for Pi day or St. Patrick’s Day. 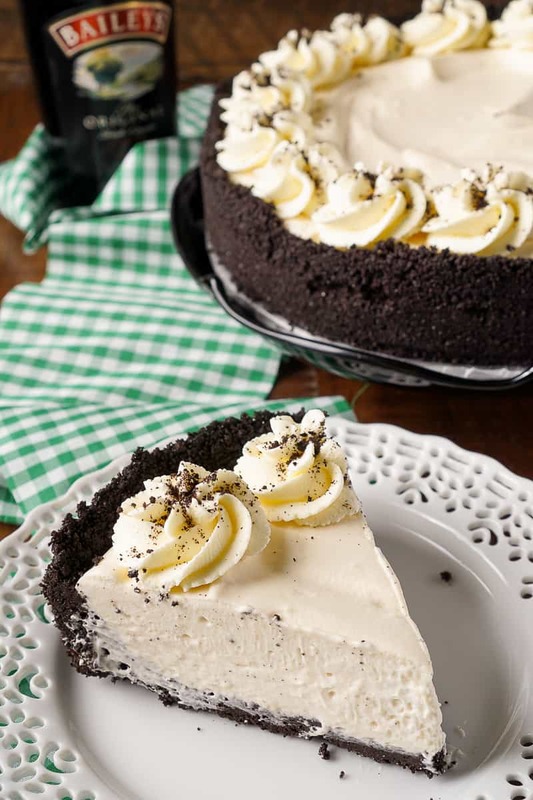 Oreo crust with a whipped mint filling, this Oreo mint pie is perfect for chocolate mint lovers! 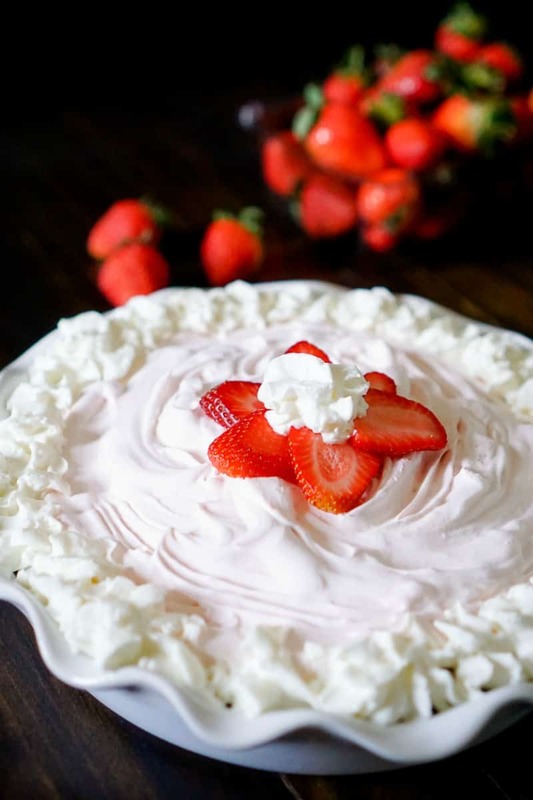 Try this no bake pie for an easy to make dessert recipe. Place Oreo cookies into the bowl of a food processor and pulse into fine crumbs. Add the melted butter and process just until the crumbs are moistened and stick together when you press with your fingers. Press into a 9" pie plate or springform pan using a spoon or measuring cup to compress crust down and to the sides. Place in the freezer while you make the filling. Meanwhile, in a separate large bowl, beat the softened cream cheese until light and creamy. Add the peppermint extract and food coloring (if using) and mix until combined. Slowly add the powdered sugar until uniform and well incorporated. In a separate bowl, use an electric mixer with the whisk attachment to whip the heavy cream until stiff peaks form. Gently fold whipped cream into the cream cheese mixture, reserving some for garnish. Fold in chocolate chunks. Remove crust from freezer and spread filling evenly over Oreo cookie crust and chill in the fridge for at least 3 hours or freezer for 1 1/2 hours. Garnish with more whipped cream and top with Oreo cookies, if desired. Serve chilled. Can store in fridge covered for up to 3 days or 1 month in the freezer. NOTE: It may be kind of quiet around here for the next few weeks while I am at the final stages of finishing my cookbook manuscript. This pie sounds incredible!! I love chocolate and mint together! I’m in pie heaven! This is simply gorgeous – love how simple this is, Kelly! My daughter LOVES Oreos and she would inhale this pie in .10 seconds if I made it for her! Kelly, this is perfection for BOTH Pi Day and St. Patrick’s Day!!! Beautiful!!!! I love that vibrant color of frosting… I wish I could get one bite…. I’m loving the color of this pie!! It’s perfect for Pie Day and very fitting for St. Patrick’s Day as well! Oh man, this just looks perfect! 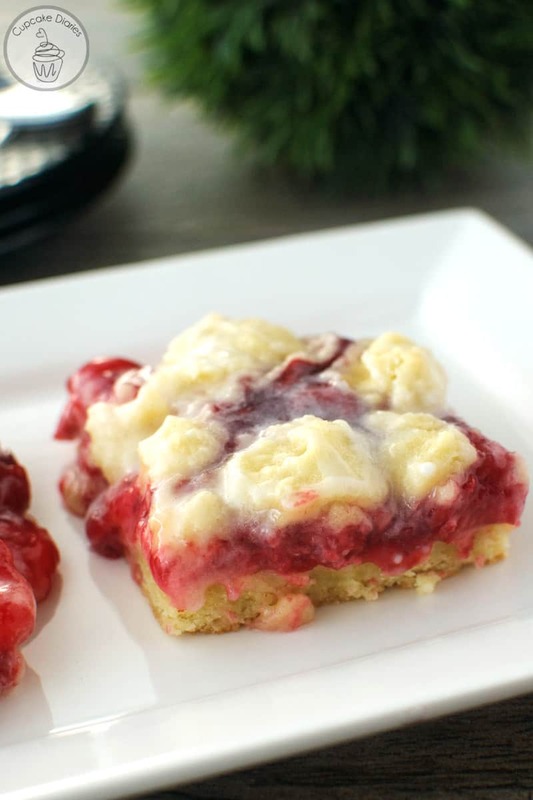 My dad would love this and I’m thinking it would be a great Father’s Day dessert! You know that chocolate and mint is my favorite flavor combination. Add in the fact that this is no-bake makes this an ultimate winning recipe! Yay! 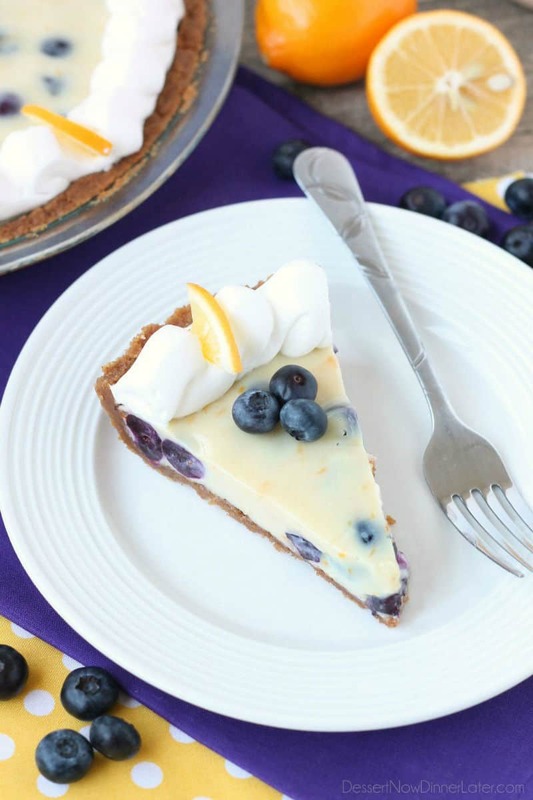 Oh my, your slice of pie couldn’t be more perfect – looks incredible! I’d love a piece of this today! 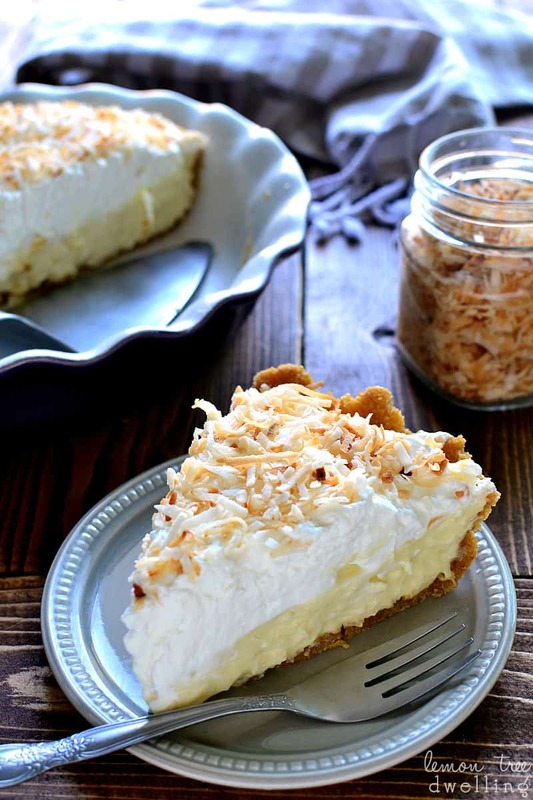 I love a good no bake pie! The chocolate mint is such a great combo! Oh this pie looks SO good, Kelly! Mint chocolate is my favorite and I’m loving that this is no bake! So perfect for pi day and St. Patrick’s Day! Yum! So creamy and delicious! The perfect way to celebrate Pie day or St Patrick’s Day! 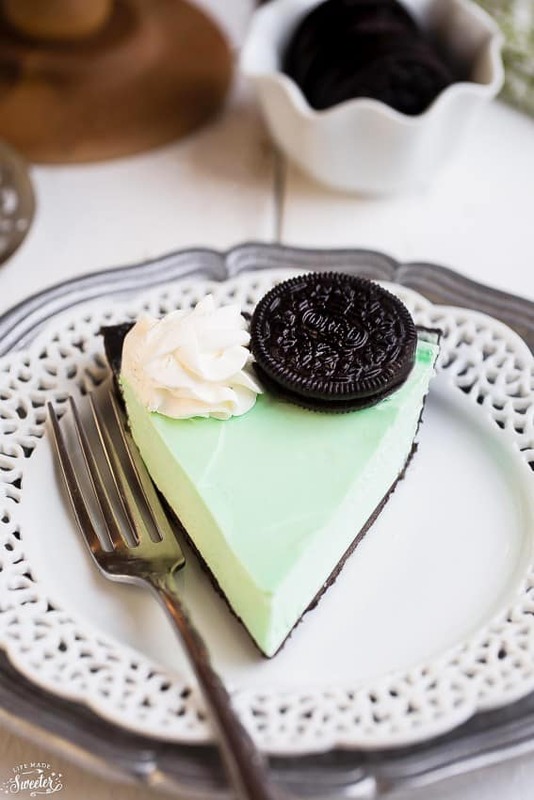 Oh my, this mint Oreo pie looks incredibly delicious! I’d love that slice right now! Kelly, this pie looks like chocolate mint perfection! It’s so pretty, and it would be just perfect for St. Patty’s Day! Anything chocolate + mint is a HUGE favorite of my husband’s!! I like it too but I think it’s his favorite combo hands down. This pie looks and sounds delicious! Hope you had a great weekend friend! This pie is simply perfect Kelly! I absolutely love the colour!! YES, please! I’ll take a big slice! This looks so delicious, and I loooove that it’s no bake. Totally swooning. Mint and chocolate is the best combo. What a gorgeous looking pie! It’s luscious, smooth, creamy, and I love the color. And the fact that it is no bake is the icing on top! That’s a whole lot of PIES!!! 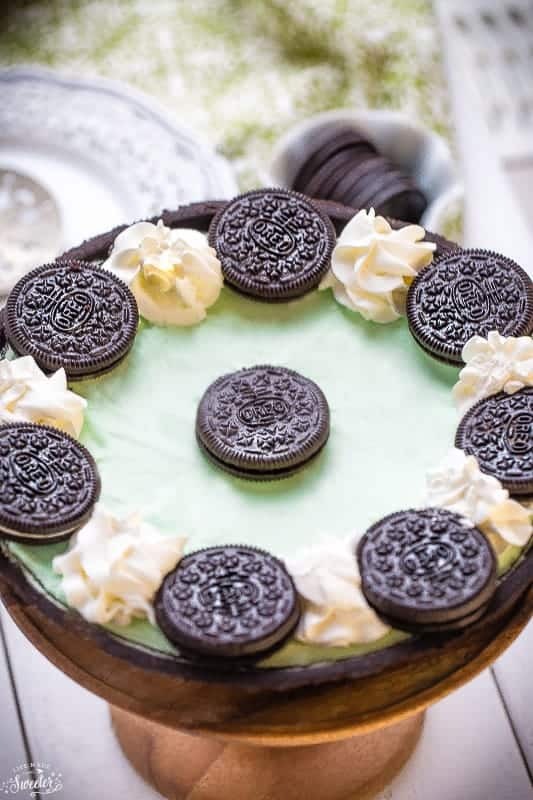 This mint oreo pie looks gorgeously delicious, Kelly. 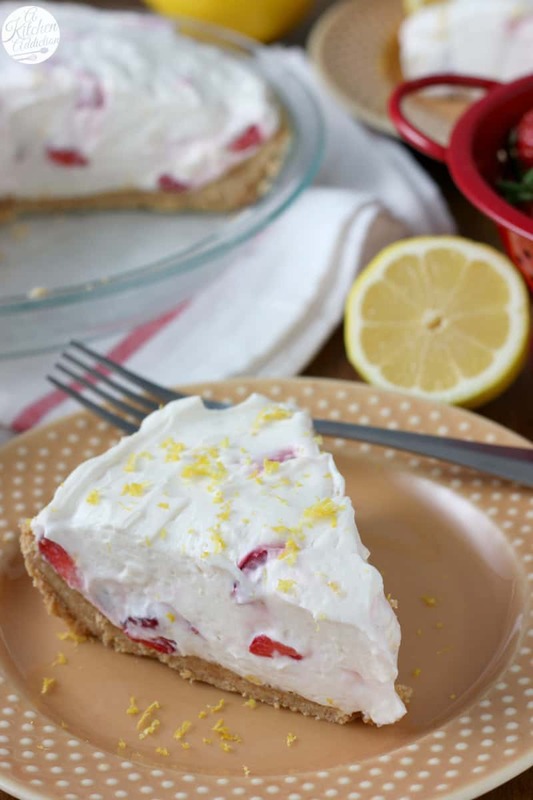 Absolutely loving the idea of no-bake pie. YUM! Can you believe that I didn’t have any pie on Pi day? I missed out! 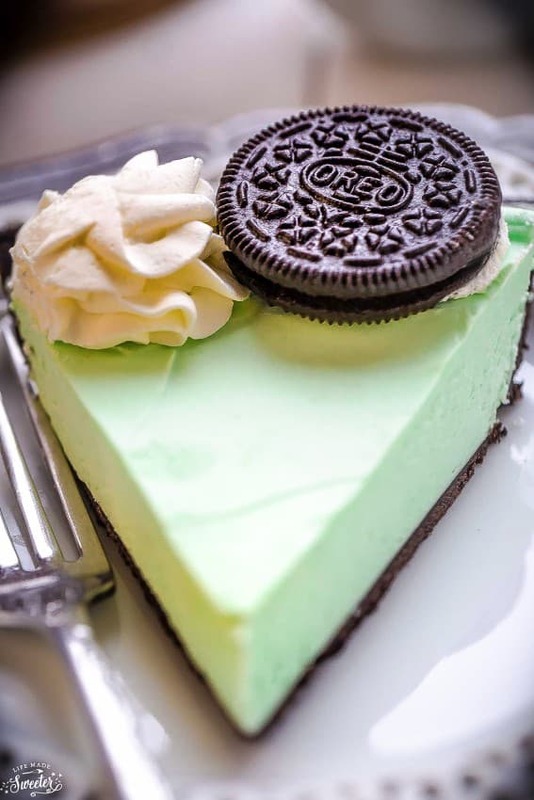 This looks like my kind of pie though, as I love chocolate mint desserts. I’m totally thinking mint and green right now, too. This pie looks beautiful and sounds so easy to make. Very tempting! This looks incredible! Chocolate-mint is one of my favourite ice cream flavours, and I love that this could be for Pi day or St Pat’s! So easy and looks gorgeous Kelly! Great combination, perfect for St Patrick’s Day! Pinned! What a beautiful pie Kelly! You can’t beat a no-bake! It looks incredible! I am usually not a fan of food colouring, but you just did it right with that glorious light green. Perfect! Hi Kelly, have not had oreos in years, love the combo of chocolate and mint. You make the best sweets!!! Ummm, yes please. 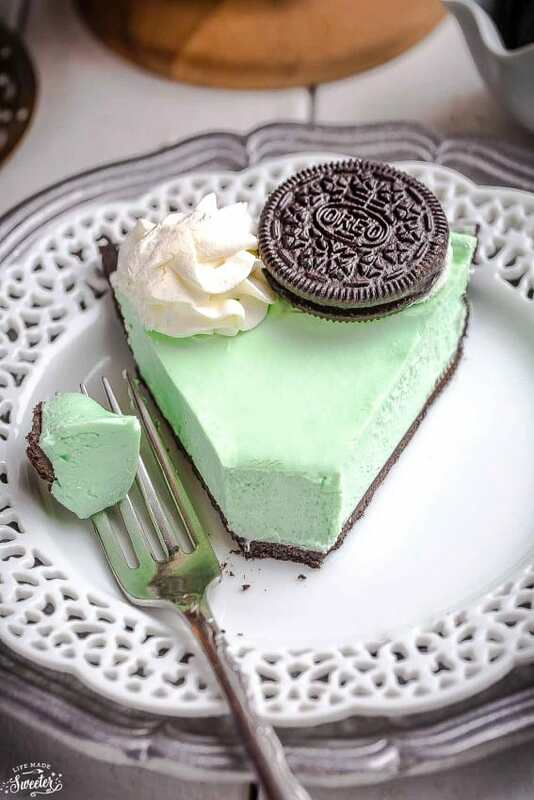 Give me this mint oreo pie ASAP. Seriously, this looks so good Kelly! This pie would totally make my grandma proud! Haha! I love the combination of chocolate and mint. I bet you love Junior Mints like me. You totally got the PERFECT slice on this pie! It’s picture perfect! Absolutely GORGEOUS and festive all at once! I can’t wait to look at the other pies in the round up! My what a pie to celebrate pi day with or any day for that matter. I’d love a slice of this right now! I am totally a cream pie over a fruit pie kind of girl. THIS is a pie! 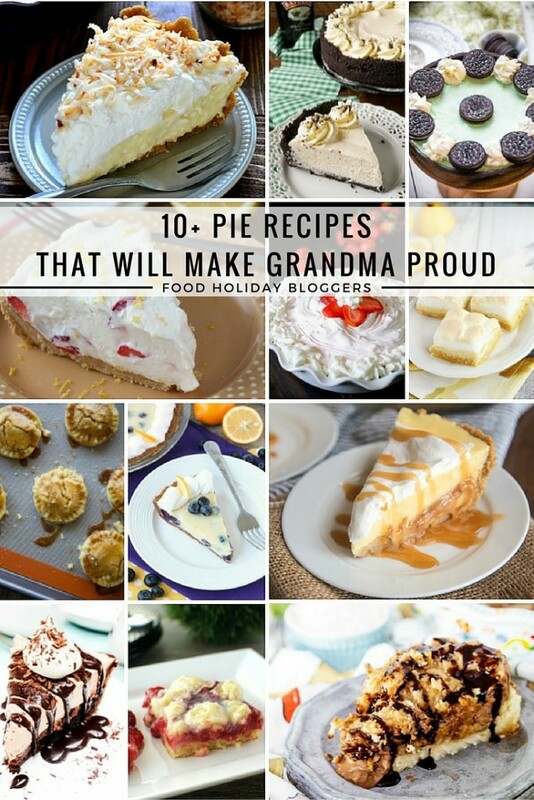 Plus, I love mint and chocolate and cream cheese and whipped cream so…. win win win! Gorgeous Kelly! Mmm! 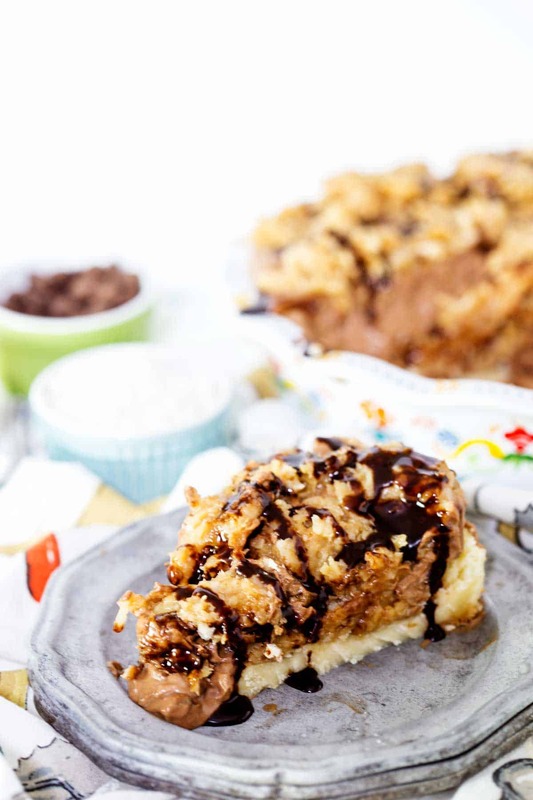 Kelly, I love mint chocolate and this no bake pie looks amazing! I soooo dropped the ball on Pi Day! But, I like to eat pie EVERY day so I’ll just have to figure out a different day to make this deliciousness. 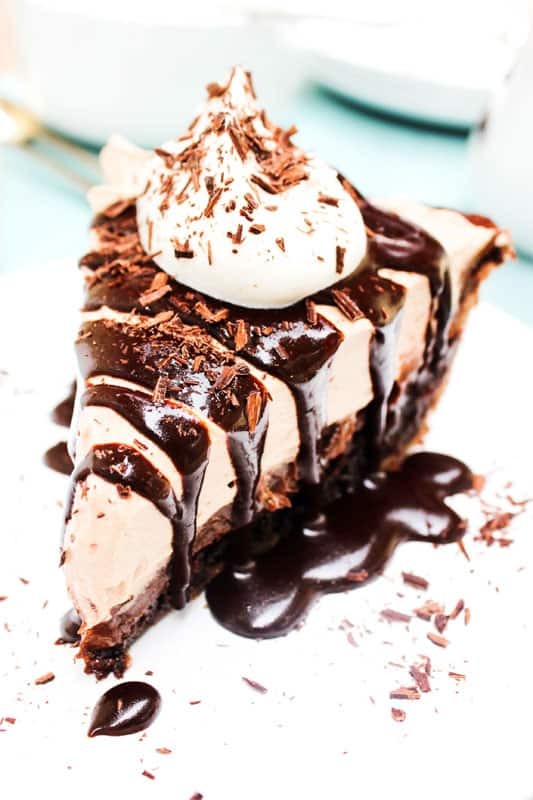 🙂 Mint and chocolate is the best dessert combo and this pie looks SO yummy! I can’t even express how much I want a piece of this pie, right now! You’ve done it again, my friend! A delicious flavor combination in such a pretty package! This pie looks fabulous with its color and ornament! And the comination of flavors is awesome…mint and chocolate… yum! How did I miss this round-up for Pi Day?! 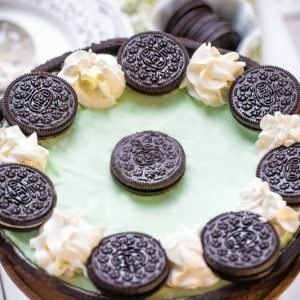 This no bake chocolate mint Oreo pie is everything! My crazy hubby does not like mint, but thank goodness all the kids do! Otherwise I wouldn’t have a good excuse to make this amazing pie! I love love love Oreos! I bet this pie is amazing! BTW I went to leave a comment on your Peanut Butter Bites and saw that you’re creating a cookbook. That’s so awesome … can’t wait till it’s released! Great Recipe. I’ve tried it at home. Everyone liked it so much. Thank You!! Oreo and mint, what a great combo! This looks delicious!